The Lonnie Poole Golf Course bears distinction as the only collegiate course ever designed by golf legend, Arnold Palmer. It is a living laboratory for our academic turf sciences and water quality research in plant and soil sciences. 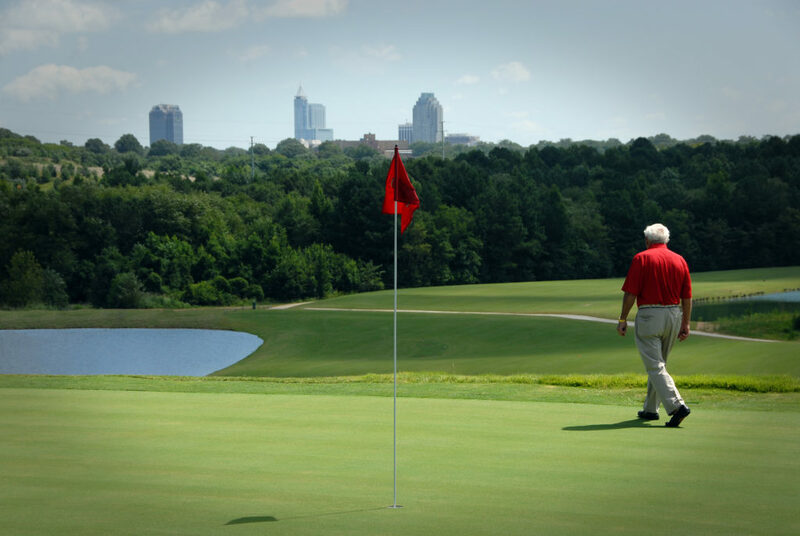 It is considered an outstanding public golf course in the Carolinas and a top collegiate golf course in the United States. The design represents the evolution of golf course architecture toward sustainability by fitting into and protecting the natural environment, leaning heavily on traditional Scottish designs while accommodating the natural landscape. The Arnold Palmer Design group used inspiration from features in the existing landscape as the primary cues for their design. 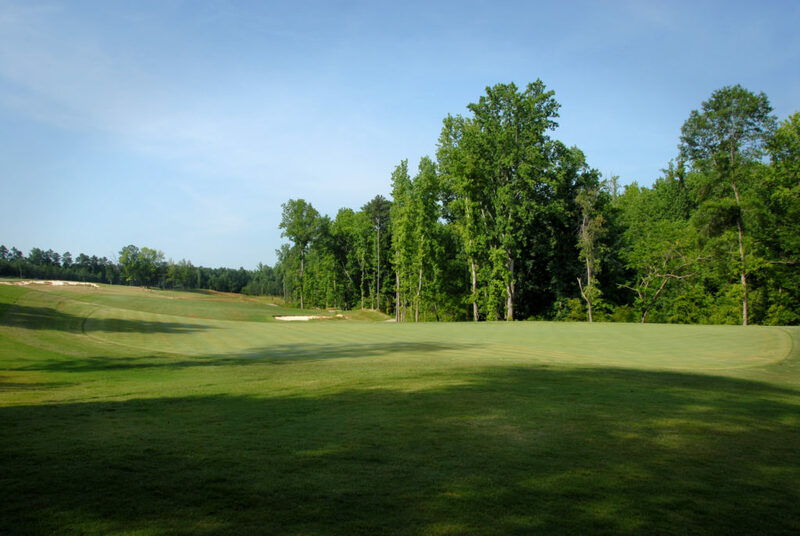 The golf course routing is dictated by large elevation changes and large buffer areas that were left in place to protect streams and wetlands in the Neuse River watershed. The buffers also provide a protected habitat for wildlife and native plant species. The course has many well-known turfgrass species at its heart: 419 bermudagrass on the fairways and primary rough, and an A1/A4 creeping bentgrass mix on the greens. The tee boxes are bermudagrass in full-sun exposure and zeon or zorro zoysia grass in the shade. The bunkers are outlined with zeon zoysia grass to provide visual definition and low maintenance edges. The secondary rough is a mixture of fine fescue species. 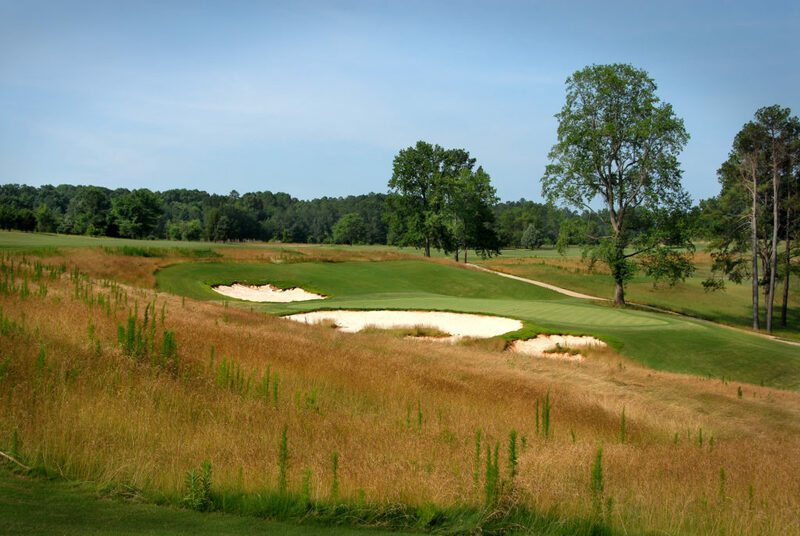 Wild grasses — Little Bluestem and Broomsedge — were transplanted into the fescue in localized pockets allowing the secondary rough to evolve into a mix of cool and warm-season grasses adapted to the North Carolina environment that has low resource and maintenance requirements. The secondary rough areas establish a color contrast with the fairways and tees. In summer months, the mature fescues in the rough are dominated by tans and browns compared to the vivid greens of bermudagrass and zoysiagrass. The reverse is true in winter when the secondary rough is green and the dormant bermudagrass and zoysiagrass are tan. One of our most distinct trademarks is our bunker design, featuring irregular shapes and jagged edges, as geometric shapes are rarely seen in nature. Islands and peninsulas with zeon zoysia grass intersect and blend with the rough. 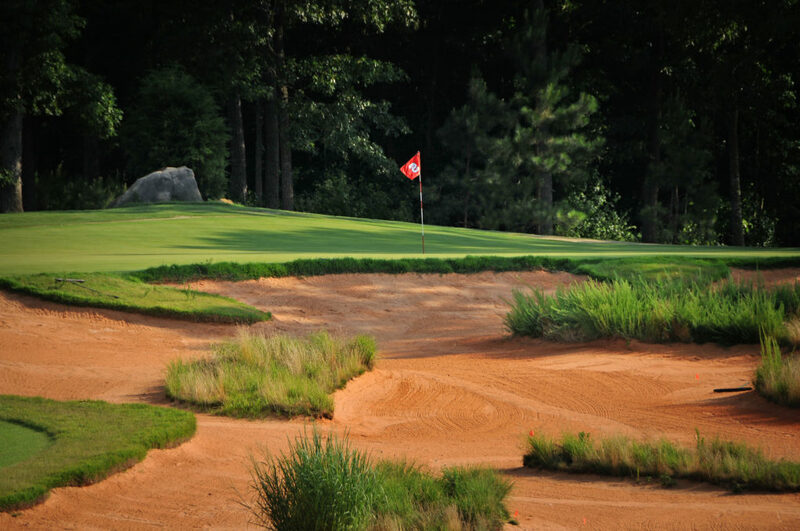 The course uses the Better Billy Bunker System, which complements our sustainable approach to the game of golf by requiring less labor/emissions to maintain consistent bunker play, rain or shine. Our downtime following heavy rain has been reduced to almost zero, as this design permits draining and a quick return to play.